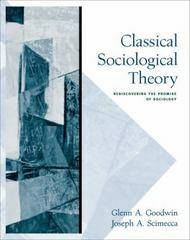 Classical Sociological Theory 1 Edition Based on the theme that the authors call "rediscovering the promise of sociology," CLASSICAL SOCIOLOGICAL THEORY covers the period from the early 19th century and the emergence of the distinct field of sociology through the first decades of the 20th century. The three major theories of functionalism, conflict perspective and the beginning of symbolic interactionism are all developed in the classical phase. After identifying the emergence of a social philosophy dating back to the Enlightenment in chapter one, the text then follows a pattern in which each chapter is devoted to one of the major theorists and their work. Theorists are placed into their social and intellectual context. Each chapter devotes considerable content to an explanation of the writers core principles, and then submits each principle to a series of four fundamental questions. The chapter ends by providing an assessment of each of the theorists.